He was responsible for sending six million Jews to their deaths. But where little Rosa Bernile Nienau was concerned, Adolf Hitler seemed blind to his own warped ideology. 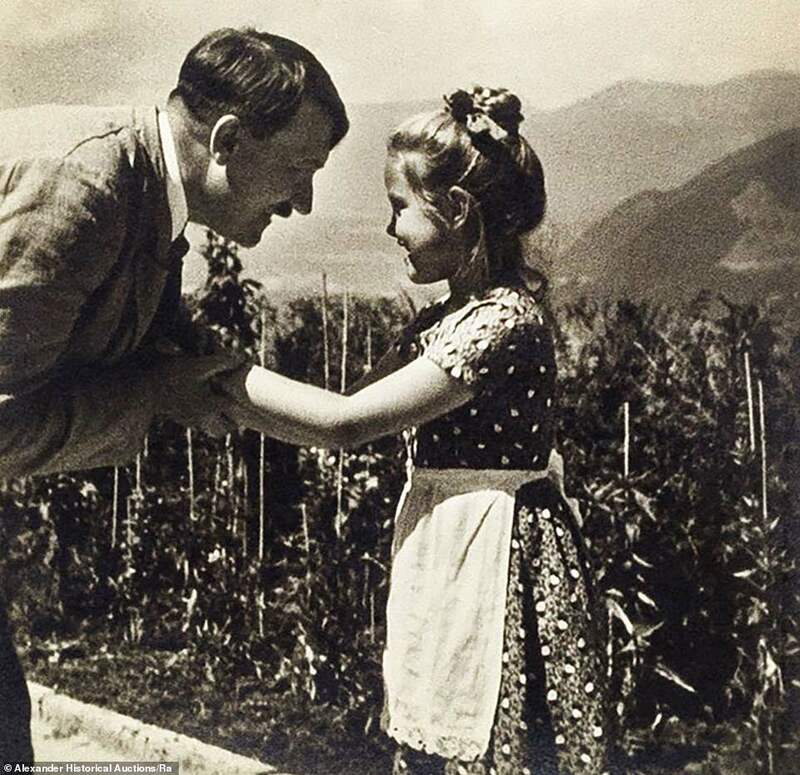 This astonishing photograph shows the smiling Nazi leader embracing the young Jewish girl - who referred to him as 'Uncle Hitler' and became known as his 'sweetheart' - at his Alpine retreat. Personally inscribed by Hitler, the photograph was taken in the summer of 1933 at the Berghof - just six years before the outbreak of the Second World War. Incredibly, Hitler knew Rosa, aged just seven when the picture was taken, was considered Jewish under German racial laws at the time. The Nazi persecution of Jews had already started, with attacks and boycotts of Jewish shops and a purge of the civil and professional services. But he refused to sever ties with her - and it was only when the Fuhrer's private secretary, Martin Bormann, discovered Rosa's lack of 'German bloodliness' in 1938 that she and her mother were eventually banned from seeing him. Tragically, Rosa died of spinal polio five years later. The photo, taken by his official photographer Heinrich Hoffmann, is signed by Hitler in dark blue ink: 'The dear and considerate Rosa Nienau, Adolf Hitler Munich, the 16th June 1933.' It is being sold at Alexander Historical Auctions in Chesapeake City in the US state of Maryland on November 13, and is expected to attract bids of up to $12,000 (around £10,000).
. . . Auctioneer Bill Panagopulos said: ". 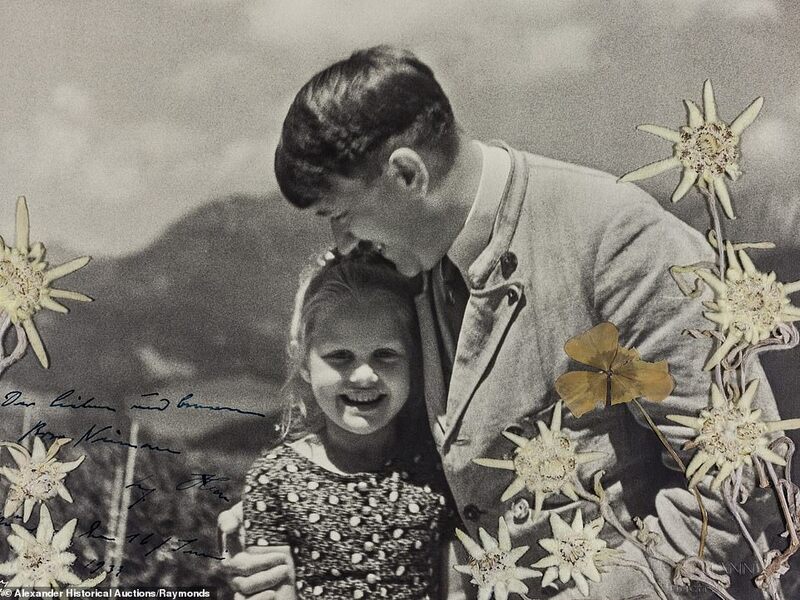 . . Hitler was very often photographed with children for propaganda purposes. The shocking thing about this piece is it seems he had a genuine affinity for the young girl. I was simply stunned. Rosa and Hitler grew very close, so much so that the dictator refused all efforts to ban her from his company. In the end, he gave in and the girl and her mother were instructed to keep away and remain silent." Rosa visited the Obersalzberg complex for the first time with her mother, a doctor's widow, in 1932. The following year, they were among a group of visitors who congregated outside Hitler's retreat on his birthday, April 20. When the Fuhrer was when informed that the child shared his birthday, he invited her up to the house and gave Rosa strawberries and whipped cream on the terrace. Mr Panagopulos added: "She quickly developed a close and warm friendship with her 'Uncle Hitler' which lasted until 1938. Indeed, the Bundesarchive retains 17 letters from her to Hitler and aide Wilhelm Bruckner between 1935 and 1938. Rosa's grandmother was a Jew so she was one-quarter Jewish, and therefore 'Jewish' under German racial laws in 1933." Mr Panagopulos said research showed that Hitler became aware of the girl's Jewish heritage, but 'chose to ignore it'. But when Reichminister Martin Bormann discovered her lack of 'pure' German blood, he forbade mother and daughter access to the Berghof. He added: "In the book Hitler, As I Saw Him, Hoffmann tells us that Hitler is said to have overruled Bormann, complaining: 'There are people who have a true talent for spoiling my every joy.' However, despite Hoffman's continued use of Nienau's images in his books and publications, by May, 1938 the family was ordered to cease contact with upper party members, including Hitler." "Hoffmann captioned another photo of Rosa and the Fuhrer strolling in the grounds 'Hitler's Sweetheart'. It delighted him to see her at the Berghof until some busybody found she was not of pure Aryan descent." Hitler was sworn in as Chancellor of Germany in January 1933, shortly before the photo was taken. I've researched the guy and I find that he makes a poor caricature for evil. I'm not saying he wasn't evil, it's just that he was more complex a character than is generally portrayed. Stalin is more of a pure evil type of character, as there is less nuance with him than there is with Hitler.